It may not be as spectacular as some of the great brooches from eighth-century Ireland, but there are two important things about this beautiful piece of metalwork found near Roscrea, Co. Tipperary. It is distinctively Irish; and it could not have been made without the Vikings. About a century after the Scandinavian raiders began to appear as terrifying intruders, we have an object that tells a story of cultural integration. The Viking presence in Ireland was not an easy one, but Irish culture was good at absorbing influences and remaking them, even when they came in the form of an initial violent shock. The imprint of the invaders on Irish metalwork is obvious. First, there is the basic material: high-quality silver. Good silver had been rare in Ireland, where it was used sparingly and for highly prized objects. The Vikings had access to vast quantities of the metal. Through trading, Irish craftsmen got access to lots of silver. There is another imported material that is obvious in the Roscrea brooch: the settings are made of amber from the shores of the Baltic Sea. Previously, these features on an Irish brooch would have been made of coloured glass or enamel. Yet, for all the silver and amber, no one would have had any difficulty identifying this as an Irish object. The gold filigree work on the brooch, albeit cruder than appears on its predecessors, is clearly mimicking older, more sophisticated Irish work. The abstract patterns and elongated animals are typical of the basic forms of Irish visual art. There is as much continuity here as there is innovation. The fact that Irish craftsmen are using Viking materials and influences (and, more importantly, that their Irish patrons are comfortable with them doing so) tells us that the Viking invasions were traumatic but not catastrophic. They did not destroy native Irish power. They did not trigger a ‘nationalist’ response in which the Irish banded together to drive out the foreigner. They did not produce a cultural reaction of seeking to emphasise the purity of indigenous traditions in the face of new challenges. Instead, Irish rulers competed with the Scandinavians when they could, attacked them when they were vulnerable, traded with them when it was profitable to do so and extorted money from them when the opportunity arose. They also used them as military allies in their continuing conflicts with rival Irish dynasties. As early as 850, the king of North Brega, Cináed Mac Conaing, attacked the Uí Néill and ravaged their lands in conjunction with the Norse. As a reminder that the Vikings did not invent violent raiding, Cináed burned a church with 260 refugees inside. 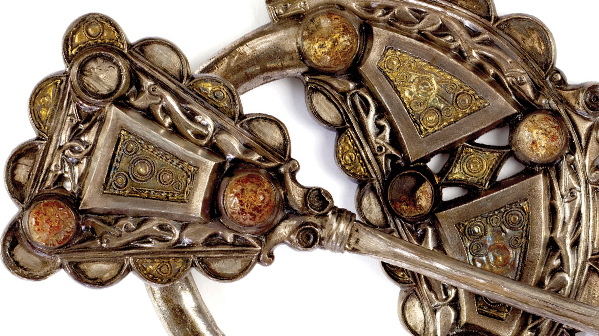 The Roscrea brooch tells us that there were more creative cross-fertilisations of the cultures as well.